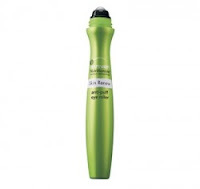 Ok- here is this week's I can't live without product.It's the Garnier Nutritioniste Anti-puff eye roller.It rolls on a clear cooling gel that is very soothing. I really didn't give it too much hope because I always have puffy eyes with dark circles even on the rare occasions I get enough sleep. Even if I don't have a drop of other makeup on I will always have cover-up under my eyes to avoid small children will running away in fear. However- after using this product for 2 weeks I noticed a difference. I'm not as puffy(at least my eyes aren't) and the dark circle though not gone are definitely lighter. I bought mine at Walmart for around $10.00 and every time I go to purchase another one they are sold out. If you happen to see one grab it!